The KCV cove heater provides warmth from above. 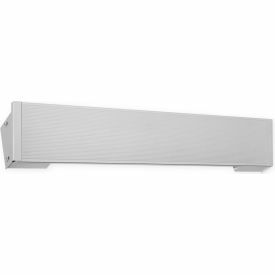 A space-saving radiant heater that also produces convection heat by heating the air similar to a baseboard. By combining the quick comfort of radiant heat along with the sustained warmth of convection heat, warm air is uniformly dispersed throughout the room. The cove heater is mounted near the ceiling, eliminating furniture placement problems. Surface temperatures are lower than baseboard or fan heaters, making a pleasant form of heat similar to older ceiling cable heating systems. With no moving parts this heater is quiet and maintenance free. Typical uses are day care centers, assisted living housing, housing developments, laundry rooms, bathrooms, bedrooms.